After a few weeks of experimenting with the K8400 and the TMC2130, which can work without the SPI functionality on the original FW with a small modification. Before we start want you to know that you’re doing this on your own risk and if you bork your printer it’s not my fault. I’d recommend you to first watch Tom Sanladerers video on the drivers, he’ll give you the information you need on how to solder pins etc. Okay first you need to take out the main board from your printer since you need to do some soldering. So if you have the RGB leds installed I’m not 100% sure this will work since we need some pins from there for Chip Select. But anyway, solder pins to the connectors make sure the pins point upwards, and then put the board back. 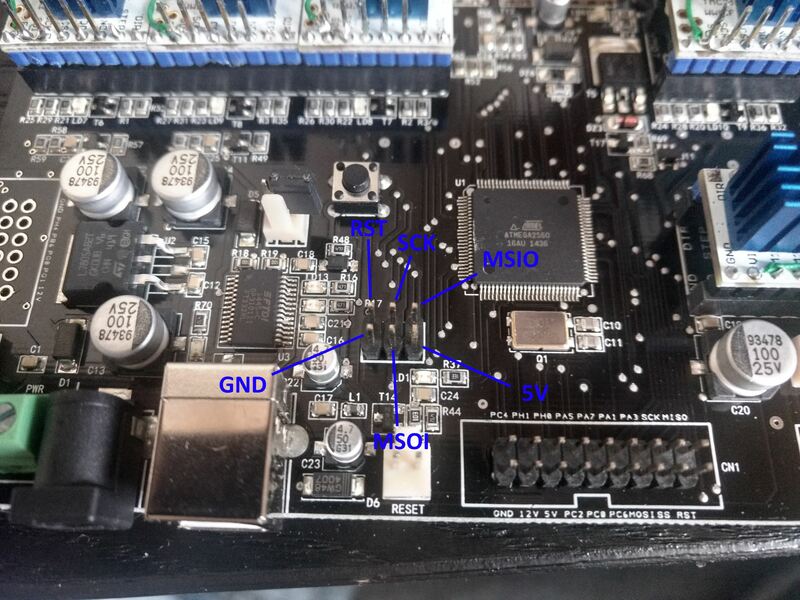 Now we need to find the SPI pins, and they are conveniently placed in the middle of the board. Use some of the jumper pins and solder 5 (4 if you only have 1 extruder) cables to a header connector use some heat shrink tube if you want to make it tidy. Do this so you have 5 cables from MOSI, MSIO and SCK. Now you should connect everything like this. Now the hardware part is finished and now we need a modified FW to run it. Download if from marlins website and do the following modifications. Make sure you copy the right config file. and past it in the Marlin root folder and overwrite the original files (or make a backup of them if you want). Use the latest version of arduino for this. look change the pin number so they match the pins we soldered earlier. This is the setting we needed to make basic TMC2130 SPI functions to work. Now we need to install a required library to make the FW be able to communicate with the drivers. Now we’re ready for compilation. If you have a heated bed or other mods, make sure you do the necessary changes in the FW before you upload. Congratulations you now have a smart K8400! Adding one more info here (not really related to this, but will help others trying to do the same. There is a bug in latest Marlin fw 1.1.8 in Velleman K8400 configuration.h file, so you can not compile it directly. (Lots of people have minimal capability to find out what is wrong). Problem is on line 788 where the Y_MIN_POS is set to 20, sanity check gives error as the bed size is over bounds. the 2130 is not working good with that, i’ve wasted several hours of trying to succeed. there everything is almost perfect for the upper scenario, i did not try the homing without the endstops. The options are used to determine driver pulse timings as well as more advanced functionality. Thank you for implementing those drivers! PS: heatsinks are required, otherwise it will lose position and printe anything but the right gcode. At least that’s my experience! I also recommend cooling the heatsink with a silent fan. Thank you everyone for the feedback, I am now in the moment of testing it with the latest stable 1.1.9 build. and as @unclescrooge said, heatsinks are required, I even replaced the cooling fan to a bigger one right over the board to deal witht he heat. Thanks for your guide. Made the hardware and going to modify the software now. Did you use 1.1.9 already? Are there any more remarks to make before I start this creepy job? Please, does anyone have a working firmware with TMC2130 for me? Some time later: Tried some things, but it doesn’t work. Can’t use an old Configuration_adv.h in a new sketch… If I use a new adv.h, it doesn’t work either. Please could someone put a firmware here? Can upload the old firmware again without problems. update 3: Why does the guide not mention to copy the old ultralcd.cpp file too, to get a working display? The display shows text now but is still freezing. Please, please, is there somebody around who can provide me with a working TMC2130 Firmware for the Vertex? You already have the working firmware. The firmware provided from the original link is the one you need. There is just some stuff you need to modify in Marlin to use the alternative settings for TMC2130. Just follow the guide and check my remarks. The original motors are just too much for the TMC2130, the TMC is rated to much lower amps in continuous load, so they will start to cause troubles in long prints. Only way to fix this is to change the motors to 804´s, I went through this problem so I am talking from experience. Or, you have to lower the speed considerably, like 50%. Thank you very much for your answer. After a week I managed to get the firmware up and running. I couldn’t upload the firmware without errors. But ultimately, it succeeded with Marlin 1.1.9 with copied and pasted text of the configuration.h and adv.h. With stealthChop I get layer shifts, but in spreadCycle stepping mode it’s running fine. But didn’t do long prints yet. My default print speed is 60 mm/s. Is that too fast? And what do you mean by ‘804s’? Which max. current should it be? as 811 ones, but they consume much less Amperage in use, so the layer shifting should not happen. TMC 2130 can not hold the high current draw that the original motors take, they are rated to max 1.2A, with short time 2.5A peak. So, I noticed that if the head slightly touches the print, the layer will shift as the stepper can not provide the current needed to push through the “blob”. The power supply is also too small, if I recall right its only 150W, I will upgrade it soon to 200-250w. So, the original motors are wantai 42BYGHW811, they have rated current at 2.5A max. Alternative motors which will work with the TMC2130 are 42BYGHW804, with rated max amps of 1.25A. TMC2130 will work much better with them. The are some things you need to consider though, the bed should (Z axle) still remain with the original stepper controller and 811 motor. Same with the extruder motors, as stated earlier. So you really only need to replace the X & Y motors + TMC2130´s for them to get the printer significantly quieter. I do run my printer quite slow, as it gives better print quality and I have e3dv6 head in it. I think I am running mostly at 40-45mm/s, I have also added a fan to cool the TMC´s. 42BYGHW804 is some what weaker than 811, but if everything is set ok, there should not be any issues running the Vertex with them. Check of course that belts are not too tight and the head assembly moves easily, and remember to lubricate the metal rods. I use grease made for sleeve bearings that I also use in my RC heli´s. You can get those motors (D-shaft) from 16-30€ / pce, so not very expensive. Thanks again for your reply. In the mean time I am printing fine with the existing stepper motors and I swapped all four stepper drivers (1 printhead). I don’t know if this matters but I’ve also got the stepstick-protectors in between. Earlier I changed the belts and pulleys to GT2 20 teeth and a 300 Watt PSU for the motors and another 24V PSU for the heatbed. Stepper drivers with heat sinks and an additional cooling fan. And as I mentioned before I use the spreadCycle stepping mode with 60 mm/s speed and it’s doing well.